Shri Advaita Acharya is a very important person to understand in the Krishna consciousness movement. 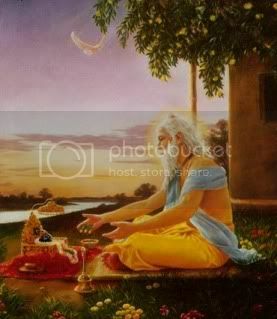 He is in the category of God, yet is also a great devotee of God. He is one of our many superlative family members and spiritual superheroes! Before I briefly speak on this, I thought it would be important to consider what someone from another religion might think of this day, and why: On appearance days, or so-called, “birth” anniversaries of great manifestations or incarnations of God, someone from another religion may criticize the observance. They may say, chidingly, “O, they are celebrating the birth of another one of their many Hare Krishna or Hindu gods”. 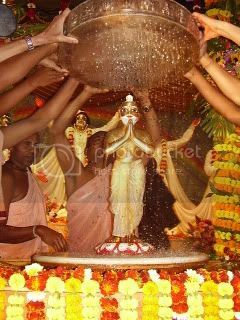 Many people think that Hinduism (as the Vedic path is called in modern times) is about worship of many gods—and often strange ones at that! Or they may think we are animalist or worship forces in Nature and so on. Actually, the heart of the teaching of the Vedas, or Sanatan Dharma, is that there is one supreme spiritual force or God in the Universe and beyond it. In understanding Shri Advaita Acharya, Shri Nityananda, Shri Chaitanya, Lord Krishna or a host of Avatars which are said to be unlimited in number, it will be helpful to accept the idea of “Godhead” being a spiritual substance or divine energy which can have unlimited manifestations. God is one, yet that “one” is unlimited and ever expanding. God, who we consider to be in his ultimate aspect, Krishna, has different desires, purposes, and necessities, and thus different forms. 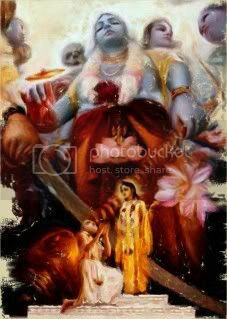 From another perspective, the type of love a devotee has for God, will manifest in a particular Divine form of the Godhead.